Reminisce for a moment being back on the old stomping grounds at your elementary school. Not having any bills to pay – or not even knowing what bills are for that matter. Your only concern is being the first up for a game of kickball. You’re the best at this game, at least that’s what you tell yourself, and you have no fear, so you disregard the dangling shoelace as your foot connects with the ball. This level of carefreeness can once again be achieved with the arrival of the Varsity Gay League (VGL) here in Long Beach. The VGL is a nondiscriminatory organization focused on support and fun. 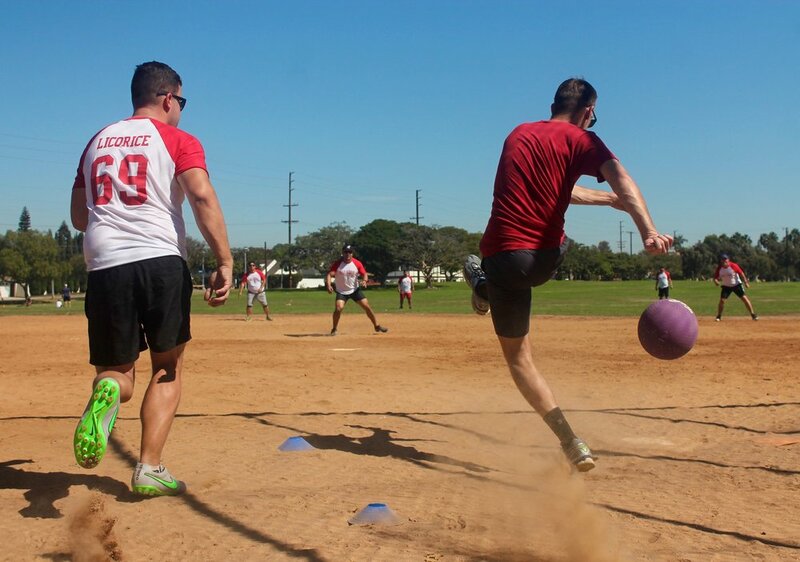 It’s a seasonal league with various out-of-the-box activities, but since the VGL is new to Long Beach, the only available sport is kickball. The Long Beach league officially began this past October and currently has 70 registrants. Since its inception in 2007, the VGL has garnered over 6,000 members throughout four separate locations. Along with Long Beach, the VGL has a presence in West Hollywood, Sacramento and San Diego, and this current fall season the combined leagues have 1,500 unique players. Originally starting with a game of capture the flag, it wasn’t until 2011 when league play was integrated with the emergence of kickball. According to the league website, it was created as an alternative to the monotony of the bar scene. One night after walking into a bar with his friends. Will Hackner, owner and founder of the VGL, looked around and decided that’s not where he wanted to spend his time. League play lasts eight weeks and contains people of all ages and skill levels. It only costs $60 to join the league at any time as a free agent, and people can be placed on a team with an open slot. For those who aren’t sure if they’d enjoy themselves, for a fee of $5, one can sub in for a game without being registered with the league. “It’s extremely hard for people who aren’t athletes, who have grown up insecure about their sexuality, who already come into any social situation with a level of fear or concern, to step outside their comfort zone and go for it,” Hackner said. According to several participants, there is a tremendous amount of bonding that comes with being in the league. League manager Alex Mehlbrech has been playing in the league for two years and was instrumental in bringing the VGL to Long Beach. The socializing plays a key role for many members. Lanigan has been playing in city leagues for a few years and loves it, but he does have one bad experience involving a non-LGBT league. As the league grows, more sports will be added like dodgeball, beach volleyball and flag football. There is one activity the VGL has that requires all participants to be at least 21-years-old and that is the beer olympics. The beer olympics involve teams and a series of drinking games such as beer pong, ribcage, flip cup and relay chugging. The league also has the potential to acquire big-name sponsors. The West Hollywood league features Bud Light, General Mills, Quest Nutrition and the Dodgers as endorsers. The Long Beach VGL is currently sponsored by local business Hamburger Mary’s. The sponsor helps with partial payment of the field rental and also acts as a post-game meeting place where players can receive discounted food. Also to ease the pain, the losing teams receive a certificate for a free pitcher of draft beer. This league is also a family affair for Mehlbrech because his mother and sister are signed up to play on his team. Long Beach is a large hub for the LGBT community, so it was only a matter of time before the VGL came to town, according to Hackner.